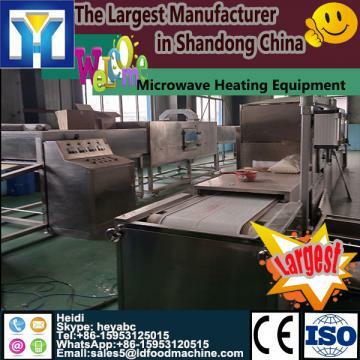 Industrial microwave heating machine is applied to drying, ripening and sterilization of black Cereals, soybeans, mung beans, corn, wheat skin, buckwheat, oatmeal, soybeans and peanuts.Drying sterilization seafood seasoning, sterilization, drying, puffing Tenebrio; rose, tea and other tea flower.Conventional thermo - thermal sterilization starts from the surface of the material, but there is an internal and external temperature difference through the heat conduction to the interior. In order to maintain the food flavor, shorten the processing time. 1. Box adopt stainless steel,fully meet with food machinery requirements. 2. Easy to operate,save the production cost. 3. Fast and uniformly heating,the high degree of automation.